The history of agriculture is the story of humankind's development and cultivation of processes for producing food, feed, fiber, fuel, and other goods by the systematic raising of plants and animals. Prior to the development of plant cultivation, human beings were hunters and gatherers. The knowledge and skill of learning to care for the soil and growth of plants advanced the development of human society, allowing clans and tribes to stay in one location generation after generation. Archaeological evidence indicates that such developments occurred 10,000 or more years ago. Because of agriculture, cities as well as trade relations between different regions and groups of people developed, further enabling the advancement of human societies and cultures. Agriculture has been an important aspect of economics throughout the centuries prior to and after the Industrial Revolution. Sustainable development of world food supplies impact the long-term survival of the species, so care must be taken to ensure that agricultural methods remain in harmony with the environment. Agriculture is believed to have been developed at multiple times in multiple areas, the earliest of which seems to have been in Southwest Asia. Pinpointing the absolute beginnings of agriculture is problematic because the transition away from purely hunter-gatherer societies, in some areas, began many thousands of years before the invention of writing. Nonetheless, archaeobotanists/paleoethnobotanists have traced the selection and cultivation of specific food plant characteristics, such as a semi-tough rachis and larger seeds, to just after the Younger Dryas (about 9,500 B.C.E.) in the early Holocene in the Levant region of the Fertile Crescent. There is much earlier evidence for use of wild cereals: anthropological and archaeological evidence from sites across Southwest Asia and North Africa indicate use of wild grain (such as from the ca. 20,000 B.C.E. site of Ohalo II in Israel, many Natufian sites in the Levant and from sites along the Nile in the 10th millennium B.C.E.). There is even early evidence for planned cultivation and trait selection: grains of rye with domestic traits have been recovered from Epi-Palaeolithic (10,000+ B.C.E.) contexts at Abu Hureyra in Syria, but this appears to be a localized phenomenon resulting from cultivation of stands of wild rye, rather than a definitive step towards domestication. It isn't until after 9,500 B.C.E. that the eight so-called founder crops of agriculture appear: first emmer and einkorn wheat, then hulled barley, peas, lentils, bitter vetch, chick peas, and flax. These eight crops occur more or less simultaneously on Pre-Pottery Neolithic B sites in the Levant, although the consensus is that wheat was the first to be sown and harvested on a significant scale. By 7000 B.C.E., sowing and harvesting reached Mesopotamia and there, in the super fertile soil just north of the Persian Gulf, Sumerian ingenuity systematized it and scaled it up. By 6000 B.C.E. farming was entrenched on the banks of the Nile River. About this time, agriculture was developed independently in the Far East, probably in China, with rice rather than wheat as the primary crop. Maize was first domesticated, probably from teosinte, in the Americas around 3000-2700 B.C.E., though there is some archaeological evidence of a much older development. 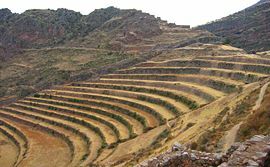 The potato, the tomato, the pepper, squash, several varieties of bean, and several other plants were also developed in the New World, as was quite extensive terracing of steep hillsides in much of Andean South America. Agriculture was also independently developed on the island of New Guinea. The reasons for the development of farming may have included climate change, but possibly there were also social reasons (such as accumulation of food surplus for competitive gift-giving as in the Pacific Northwest potlatch culture). Most certainly, there was a gradual transition from hunter-gatherer to agricultural economies after a lengthy period during which some crops were deliberately planted and other foods were gathered in the wild. Although localized climate change is the favored explanation for the origins of agriculture in the Levant, the fact that farming was 'invented' at least three times elsewhere, and possibly more, suggests that social reasons may have been instrumental. Full dependency on domestic crops and animals did not occur until the Bronze Age, by which time wild resources contributed a nutritionally insignificant component to the usual diet. If the operative definition of agriculture includes large scale intensive cultivation of land, mono-cropping, organized irrigation, and use of a specialized labor force, the title "inventors of agriculture" would fall to the Sumerians, starting ca. 5,500 B.C.E. 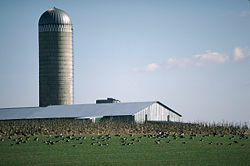 Intensive farming allows a much greater density of population than can be supported by hunting and gathering, and allows for the accumulation of excess product for off-season use, or to sell/barter. The ability of farmers to feed large numbers of people whose activities have nothing to do with material production was the crucial factor in the rise of standing armies. Sumerian agriculture supported a substantial territorial expansion, together with much internecine conflict between cities, making them the first empire builders. Not long after, the Egyptians, powered by farming in the fertile Nile valley, achieved a population density from which enough warriors could be drawn for a territorial expansion more than tripling the Sumerian empire in area. The "Fertile Crescent" of the Middle East. In Sumer, barley was the main crop, but wheat, flax, dates, apples, plums, and grapes were grown as well. While Mesopotamia was blessed with flooding from the Tigris and Euphrates rivers that helped cultivate plant life, the salt deposits under the soil, made it hard to farm. The earliest known sheep and goats were domesticated in Sumer and were in a much larger quantity than cattle. Sheep were mainly kept for meat and milk, and butter and cheese were made from the latter. Ur, a large town that covered about 50 acres (20 hectares), had 10,000 animals kept in sheepfolds and stables and 3,000 slaughtered every year. The city's population of 6,000 included a labor force of 2,500 cultivating 3,000 acres of land. The labor force contained storehouse recorders, work foremen, overseers, and harvest supervisors to supplement laborers. Agricultural produce was given to temple personnel, important people in the community, and small farmers. 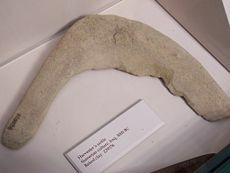 Sumerian Harvester's sickle, 3000 B.C.E. Baked clay. Field Museum. The land was plowed by teams of oxen pulling light unwheeled plows and grain was harvested with sickles. 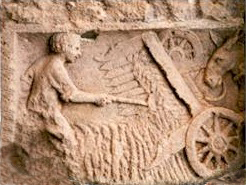 Wagons had solid wheels covered by leather tires kept in position by copper nails and were drawn by oxen and the Syrian onager (now extinct). Animals were harnessed by collars, yokes, and head stalls. They were controlled by reins, and a ring through the nose or upper lip and a strap under the jaw. As many as four animals could pull a wagon at one time. Though some hypothesize that domestication of the horse occurred as early as 4000 B.C.E. in the Ukraine, the horse was definitely in use by the Sumerians around 2000 B.C.E. Agriculture in Mesoamerica dates to the Archaic period of Mesoamerican chronology (8000-2000 B.C.E.). During this period, many of the hunter gatherer micro-bands in the region began to cultivate wild plants. The cultivation of these plants probably started out as creating known areas of fall back, or starvation foods, near seasonal camps, that the band could rely on when hunting was bad, or when there was a drought. By creating these known areas of plant food, it would have been easier for the band to be in the right place, at the right time, to collect them. Eventually, a subsistence pattern, based on plant cultivation, supplemented with small game hunting, became much more reliable, efficient, and generated a larger yield. As cultivation became more focused, many plant species became domesticated. These plants were no longer able to reproduce on their own, and many of their physical traits were being modified by human farmers. The most famous of these, and the most important to Mesoamerican agriculture, is maize. Maize is storable for long periods of time, it can be ground into flour, and it easily turns into surplus for future use. Maize became vital to the survival of the people of Mesoamerica, and that is reflected in their origin, myths, artwork, and rituals. The second most important crop in Mesoamerican agriculture is the squash. Cultivated and domesticated before maize, dated to 8000 B.C.E. in Oaxaca, the people of Mesoamerica utilized several different types of squash. The most important may be the pumpkin, and its relatives. The seeds of the pumpkin are full of protein, and are easily transportable. Another important member of the squash family is the bottle gourd. This fruit may not have been very important as a food source, but the gourd itself would have been useful as a water container. Another major food source in Mesoamerica are beans. These may have been used as early as squash and maize, but the exact date of domestication is not known. These three crops formed the center of Mesoamerican agriculture. Maize, beans, and squash form a triad of products, commonly referred to as the "Three Sisters," that provided the people of Mesoamerica a complementing nutrient triangle. Each contributes some part of the essential vitamin mix that human beings need to survive. An additional benefit to these three crops is that planting them together helps to retain nutrients in the soil. The Aztecs were some of the most innovative farmers of the ancient world, and farming provided the entire basis of their economy. The land around Lake Texcoco was fertile but not large enough to produce the amount of food needed for the population of their expanding empire. The Aztecs developed irrigation systems, formed terraced hillsides, and fertilized their soil. However, their greatest agricultural technique was the chinampa or artificial islands also known as "floating gardens." These were used to make the swampy areas around the lake suitable for farming. To make chinampas, canals were dug through the marshy islands and shores, then mud was heaped on huge mats made of woven reeds. The mats were anchored by tying them to posts driven into the lake bed and then planting trees at their corners that took root and secured the artificial islands permanently. The Aztecs grew corn, squash, vegetables, and flowers on chinampas. Roman agriculture was highly regarded in Roman culture, built on techniques pioneered by the Sumerians, with a specific emphasis on the cultivation of crops for trade and export. Romans laid the groundwork for the manorial economic system involving serfdom, which flourished in the Middle Ages. By the fifth century Greece had started using crop rotation methods and had large estates while farms in Rome were small and family owned. Rome’s contact with Carthage, Greece, and the Hellenistic East in the third and second centuries improved Rome’s agricultural methods. Roman agriculture reached its height of productivity and efficiency during the late republic and early empire. There was a massive amount of commerce between the provinces of the empire; all the regions of the empire became interdependent with one another, some provinces specialized in the production of grain, others in wine and others in olive oil, depending on the soil type. The Po Valley (northern Italy) became a haven for cereal production, the province of [Etruria] had heavy soil good for wheat, and the volcanic soil in Campania made it well-suited for wine production. In addition to knowledge of different soil categories, the Romans also took interest in what type of manure was best for the soil. The best was poultry manure, and cow manure one of the worst. Sheep and goat manure were also good. 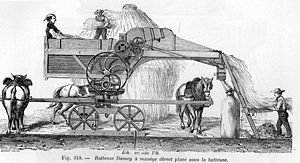 Donkey manure was best for immediate use, while horse manure was not good for grain crops, but according to Marcus Terentius Varro, it was very good for meadows because "it promotes a heavy growth of grass." Some crops grown on Roman farms include wheat, barley, millet, kidney bean, pea, broad bean, lentil, flax, sesame, chickpea, hemp, turnip, olive, pear, apple, fig, and plum. The Romans also used animals extensively. Cows provided milk while oxen and mules did the heavy work on the farm. Sheep and goats were cheese producers, but were prized even more for their hides. Horses were not important to Roman farmers; most were raised by the rich for racing or war. Sugar production centered on beekeeping. Some Romans raised snails as luxury items. Roman law placed high priorities on agriculture since it was the livelihood of the people in early Rome. A Roman farmer had a legal right to protect his property from unauthorized entry and could even use force to do so. The Twelve Tables lists destroying someone else's crop as punishable by death. Burning a heap of corn was also a capital offense. The vast majority of Romans were not wealthy farmers with vast estates farmed for a profit. Since the average farm family size was 3.2 persons, ownership of animals and size of land determined production quantities, and often there was little surplus of crops. 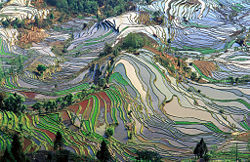 The unique tradition of Chinese agriculture has been traced to the pre-historic Yangshao culture (c. 5000 B.C.E.-3000 B.C.E.) and Longshan culture (c. 3000 B.C.E.-2000 B.C.E.). Chinese historical and governmental records of the Warring States (481 B.C.E.-221 B.C.E. ), Qin Dynasty (221 B.C.E.-207 B.C.E. ), and Han Dynasty (202 B.C.E.-220 C.E.) eras allude to the use of complex agricultural practices, such as a nationwide granary system and widespread use of sericulture. However, the oldest extant Chinese book on agriculture is the Chimin Yaoshu of 535 C.E., written by Jia Sixia. For agricultural purposes, the Chinese had innovated the hydraulic-powered trip hammer by the first century B.C.E. Although it found other purposes, its main function was to pound, decorticate, and polish grain, tasks that otherwise would have been done manually. The Chinese also innovated the square-pallet chain pump by the first century C.E., powered by a waterwheel or an oxen pulling a system of mechanical wheels.Although the chain pump found use in public works of providing water for urban and palatial pipe systems, it was used largely to lift water from a lower to higher elevation in filling irrigation canals and channels for farmland. During the Eastern Jin (317-420) and the Northern and Southern Dynasties (420-589), the Silk Road and other international trade further spread farming technology throughout China. Political stability and a growing labor force led to economic growth, and people opened up large areas of wasteland and built irrigation works for expanded agricultural use. As land-use became more intensive and efficient, rice was grown twice a year and cattle began to be used for plowing and fertilization. By the Tang Dynasty (618-907), China had become a unified feudal agricultural society. Improvements in farming machinery during this era included the moldboard plow and watermill. Later during the Yuan Dynasty (1271-1368), cotton planting and weaving technology were extensively adopted and improved. Evidence of the presence of wheat and some legumes in the sixth millennium B.C.E. have been found in the Indus Valley. Oranges were cultivated in the same millennium. The crops grown in the valley around 4000 B.C.E. were typically wheat, peas, sesame seed, barley, dates, and mangoes. By 3500 B.C.E. cotton growing and cotton textiles were quite advanced in the valley. By 3000 B.C.E. farming of rice had started. Another monsoon crop of importance at that time was cane sugar. By 2500 B.C.E., rice was an important component of the staple diet in Mohenjodaro near the Arabian Sea. The Indus Plain had rich alluvial deposits which came down the Indus River in annual floods. This helped sustain farming that formed basis of the Indus Valley Civilization at Harappa. The people built dams and drainage systems for the crops. By 2000 B.C.E. tea, bananas, and apples were being cultivated in India. There was coconut trade with East Africa in 200 B.C.E. By 500 C.E., eggplants were being cultivated. The Middle Ages owe much of its development to advances made in Islamic areas, which flourished culturally and materially while Europe and other Roman and Byzantine administered lands entered an extended period of social and economic stagnation. This was in great part due to the fact that Serfdom became widespread in eastern Europe in the Middle Ages. Development of a sophisticated system of irrigation using machines such as norias (newly invented water raising machines), dams and reservoirs. With such technology they managed to greatly expand the exploitable land area. The adoption of a scientific approach to farming enabled them to improve farming techniques derived from the collection and collation of relevant information throughout the whole of the known world. Farming manuals were produced in every corner of the Muslim world detailing where, when and how to plant and grow various crops. Advanced scientific techniques allowed leaders like Ibn al-Baytar to introduce new crops and breeds and strains of livestock into areas where they were previously unknown. Incentives based on a new approach to land ownership and laborers' rights, combining the recognition of private ownership and the rewarding of cultivators with a harvest share commensurate with their efforts. Their counterparts in Europe struggled under a feudal system in which they were almost slaves (serfs) with little hope of improving their lot by hard work. The introduction of new crops transformed private farming into a new global industry exported everywhere including Europe, where farming was mostly restricted to wheat strains obtained much earlier via central Asia. Spain received what she in turn transmitted to the rest of Europe; many agricultural and fruit-growing processes, together with many new plants, fruit and vegetables. These new crops included sugar cane, rice, citrus fruit, apricots, cotton, artichokes, aubergines, and saffron. Others, previously known, were further developed. Muslims also brought to that country almonds, figs, and sub-tropical crops such as bananas. Several were later exported from Spanish coastal areas to the Spanish colonies in the New World. Also transmitted via Muslim influence, a silk industry flourished, flax was cultivated and linen exported, and esparto grass, which grew wild in the more arid parts, was collected and turned into various articles. The invention of a three-field system of crop rotation during the Middle Ages, and the importation of the Chinese-invented moldboard plow, vastly improved agricultural efficiency. After 1492 the world's agricultural patterns were shuffled in the widespread exchange of plants and animals known as the Columbian Exchange. Crops and animals that were previously only known in the Old World were now transplanted to the New World and vice versa. Perhaps most notably, the tomato became a favorite in European cuisine, and maize and potatoes were widely adopted. Other transplanted crops include pineapple, cocoa, and tobacco. In the other direction, several wheat strains quickly took to western hemisphere soils and became a dietary staple even for native North, Central, and South Americans. Agriculture was a key element in the Atlantic slave trade, Triangular trade, and the expansion by European powers into the Americas. 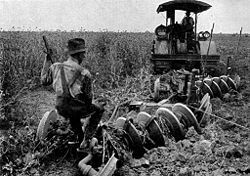 In the expanding Plantation economy, large plantations produced crops including sugar, cotton, and indigo, that were heavily dependent upon slave labor. By the early 1800s, agricultural practices, particularly careful selection of hardy strains and cultivators, had so improved that yield per land unit was many times that seen in the Middle Ages and before, especially in the largely virgin soils of North and South America. The eighteenth and nineteenth century also saw the development of glass houses or greenhouses, initially for the protection and cultivation of exotic plants imported to Europe and North America from the tropics. Experiments on Plant Hybridization in the late 1800s yielded advances in the understanding of plant genetics, and subsequently, the development of hybrid crops. Storage silos and grain elevators appeared in the nineteenth century. However, increasing dependence upon monoculture crops lead to famines and food shortages, most notably the Irish Potato Famine (1845–1849). The birth of industrial agriculture more or less coincides with that of the Industrial Revolution. With the rapid rise of mechanization in the late nineteenth and twentieth centuries, particularly in the form of the tractor, farming tasks could be done with a speed and on a scale previously impossible. 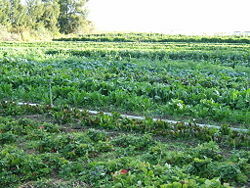 These advances, joined to science-driven innovations in methods and resources, have led to efficiencies enabling certain modern farms in the United States, Argentina, Israel, Germany and a few other nations to output volumes of high quality produce per land unit at what may be the practical limit. The development of rail and highway networks and the increasing use of container shipping and refrigeration in developed nations have also been essential to the growth of mechanized agriculture, allowing for the economical long distance shipping of produce. The identification of nitrogen and phosphorus as critical factors in plant growth led to the manufacture of synthetic fertilizers, making possible more intensive types of agriculture. The discovery of vitamins and their role in animal nutrition in the first two decades of the twentieth century, led to vitamin supplements, which in the 1920s allowed certain livestock to be raised indoors, reducing their exposure to adverse natural elements. The discovery of antibiotics and vaccines facilitated raising livestock in larger numbers by reducing disease. Chemicals developed for use in World War II gave rise to synthetic pesticides. Other applications of scientific research since 1950 in agriculture include gene manipulation, and Hydroponics. Agricultural production across the world doubled four times between 1820 and 1975. It doubled between 1820 and 1920; between 1920 and 1950; between 1950 and 1965; and again between 1965 and 1975, so as to feed a global population of one billion human beings in 1800 and 6.5 billion in 2002. During the same period, the number of people involved in farming dropped as the process became more automated. In the 1930s, 24 percent of the American population worked in agriculture compared to 1.5 percent in 2002; in 1940, each farm worker supplied 11 consumers, whereas in 2002, each worker supplied 90 consumers. The number of farms has also decreased, and their ownership is more concentrated. In the U.S., four companies kill 81 percent of cows, 73 percent of sheep, 57 percent of pigs, and produce 50 percent of chickens, cited as an example of "vertical integration" by the president of the U.S. National Farmers' Union. In 1967, there were one million pig farms in America; as of 2002, there were 114,000,  with 80 million pigs (out of 95 million) killed each year on factory farms, according to the U.S. National Pork Producers Council.According to the Worldwatch Institute, 74 percent of the world's poultry, 43 percent of beef, and 68 percent of eggs are produced this way. Industrial agriculture is a modern form of farming that refers to the industrialized production of livestock, poultry, fish, and crops. The methods of industrial agriculture are technoscientific, economic, and political. They include innovation in agricultural machinery and farming methods, genetic technology, techniques for achieving economies of scale in production, the creation of new markets for consumption, the application of patent protection to genetic information, and global trade. These methods are widespread in developed nations and increasingly prevalent worldwide. Most of the meat, dairy, eggs, fruits, and vegetables available in supermarkets are produced using these methods of industrial agriculture. While industrial agriculture strives to lower costs and increase productivity, the methods of industrial agriculture also have unintended consequences. The degree and significance of these unintended consequences is subject to debate, as is the question of the best way to deal with these consequences. Food and water is supplied in place, and artificial methods are often employed to maintain animal health and improve production, such as therapeutic use of anti-microbial agents, vitamin supplements, and growth hormones. Growth hormones are not used in chicken meat production nor are they used in the European Union for any animal. In meat production, methods are also sometimes employed to control undesirable behaviors often related to stresses of being confined in restricted areas with other animals. More docile breeds are sought (with natural dominant behaviors bred out, for example), physical restraints to stop interaction, such as individual cages for chickens, or animals physically modified, such as the de-beaking of chickens to reduce the harm of fighting. Weight gain is encouraged by the provision of plentiful supplies of food to the animals. One particular problem with farms on which animals are intensively reared is the growth of antibiotic-resistant bacteria. Because large numbers of animals are confined in a small space, any disease would spread quickly, and so antibiotics are used preventively. A small percentage of bacteria are not killed by the drugs, which may infect human beings if becoming airborne. The Green Revolution, the worldwide transformation of agriculture that led to significant increases in agricultural production between the 1940s and 1960s, occurred as the result of programs of agricultural research, extension, and infrastructural development, instigated and largely funded by the Rockefeller Foundation, along with the Ford Foundation, and other major agencies. The Green Revolution in agriculture helped food production to keep pace with worldwide population growth. The projects within the Green Revolution spread technologies that had already existed, but had not been widely used outside of industrialized nations. These technologies included pesticides, irrigation projects, and synthetic nitrogen fertilizer. The novel technological development of the Green Revolution was the production of what some referred to as “miracle seeds.” Scientists created strains of maize, wheat, and rice that are generally referred to as “high yielding varieties” (HYVs). HYVs have an increased nitrogen-absorbing potential compared to other varieties. Since cereals that absorbed extra nitrogen would typically lodge, or fall over before harvest, semi-dwarfing genes were bred into their genomes. Norin 10 wheat, a variety developed by Orville Vogel from Japanese dwarf wheat varieties, was instrumental in developing Green Revolution wheat cultivators. IR8, the first widely implemented HYV rice to be developed by IRRI, was created through a cross between an Indonesian variety named “Peta” and a Chinese variety named “Dee Geo Woo Gen."
Another method to deal with agricultural issues has become the use of Organic farming methods, which combine scientific knowledge and modern technology with traditional farming practices; accepting some of the methods of industrial agriculture while rejecting others. organic methods rely on naturally occurring biological processes, which often take place over extended periods of time, and a holistic approach; while chemical-based farming focuses on immediate, isolated effects, and reductionist strategies. Integrated Multi-Trophic Aquaculture (IMTA) is an example of this holistic approach. IMTA is a practice in which the by-products (wastes) from one species are recycled to become inputs (fertilizers, food) for another. Fed aquaculture (fish, shrimp) is combined with inorganic extractive (seaweed) and organic extractive (shellfish) aquaculture to create balanced systems for environmental sustainability (biomitigation), economic stability (product diversification and risk reduction), and social acceptability (better management practices). ↑ 4.0 4.1 M.C. Howatson, The Oxford Companion to Classical Literature. (Oxford University Press, 1989). ↑ Lewis and Reinhold, Roman Civilization Volume I (Columbia University Press, 1990. ISBN 0231071310). ↑ "Agriculture in the Indus Valley Civilization" This is My India (2006). Retrieved on August 13, 2007. ↑ 8.0 8.1 8.2 8.3 Andrew J. Watson, "The Arab Agricultural Revolution and Its Diffusion, 700-1100," The Journal of Economic History 34(1) (March, 1974):8-35. ↑ 9.0 9.1 9.2 9.3 9.4 Matthew Scully, Dominion (St. Martin's Press, 2003, ISBN 0312261470). ↑ Leland Swenson, Testimony by president of the U.S. National Farmers' Union, before the House Judiciary Committee. (September 12, 2000). ↑ Fern Shen, "Md. 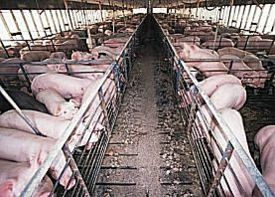 Hog Farm Causing Quite a Stink," The Washington Post, (May 23, 1999). ↑ Ronald L. Plain, "Trends in U.S. Swine Industry," (September 24, 1997). ↑ Defining the Green Revolution Retrieved August 30, 2007. ↑ A. H. Buschmann, T. Chopin, C. Halling, M. Troell, N. Kautsky, A. Neori, G.P. Kraemer, J.A. Zertuche-Gonzalez, C. Yarish and C. Neefus, "Integrating seaweeds into marine aquaculture systems: a key toward sustainability," Journal of Phycology 37, (2001): 975-986. Journal of Extension, article on case studies of the impact of large scale agriculture. National Commission on Industrial Farm Animal Production, Independent commission studying the effects of intensive animal production. History of "History of agriculture"
This page was last modified on 10 January 2018, at 15:28.